The Dead Sister is a very well-written crime thriller set in 1940's Israel. We're introduced to protagonist Adam Lapid, a private investigator who lost his entire family at Auschwitz during World War 2. 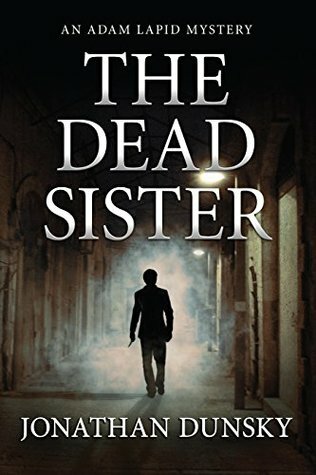 When the brother of dead prostitute Maryam Jamalka hires Adam to investigate her murder, Adam finds himself caught up in the seedy underworld of racketeering. Whilst I can't fault Jonathan Dunsky's excellent writing, I thought the pacing was somewhat slow and lacked a little in excitement. Character development was faultless and the description of Adam's personal losses at Auschwitz were particularly haunting, raw and heartbreaking. We should never forget that the horrors of the Holocaust were real. How does one come back from losing everything that ever mattered? Our protagonist finds himself in that situation and the author handles it with the utmost credibility. My thanks to author Jonathan Dunsky for providing a copy of this book. Private detective Adam Lapid has seen his share of death. He lost his family in Auschwitz. He survived the Holocaust. He nearly died in Israel's War of Independence. Now it is 1949, and Adam Lapid lives alone in Tel Aviv, Israel, haunted by nightmares, trying to rebuild his life. When a local Arab hires him to find out who murdered his sister, Adam Lapid launches an investigation that plunges him into a murky underworld of crime and depravity, and brings him face to face with the sort of evil he thought he'd left behind in Europe. Adam Lapid will do whatever it takes to bring the killer to justice -- even if it means breaking a few laws himself. Even if it means risking his own life. Will Adam catch the murderer? Or will he be the one who ends up dead?